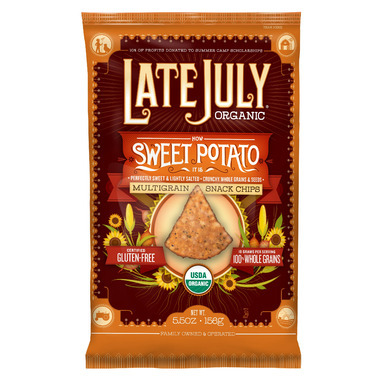 Late July chips are 100% Whole Grain, certified gluten free, and are totally delicious! Sweet Potato are perfectly sweet and lightly salted. Made with crunchy whole grains and seeds, these chips have a satisfying crunch. Ingredients: Organic Ground Whole White Corn, Organic Ground Whole Yellow Corn, Organic Expeller Pressed Sunflower Oil and/or Organic Expeller Pressed Safflower Oil, Organic Sweet Potato, Organic Brown Rice, Organic Evaporated Cane Juice, Organic Chia Seeds, Sea Salt. Nice chip. They really got it right. Corn chip but with the flavour and just a bit of sweetness from the sweet potato. Better than all corn, in my books. Are these sweet potato chips that tasty? Well, I'm ordering them again so you figure it out. I love these, they are great on their own or dipped in some salsa or hummus. But I was expecting more of a sweet potato flavour.